Four Miles, Two Paintings and One Baby – Going Solo at the Bridge to Nowhere. It’s high time I introduce my son to a trail that means so much to me – Bridge to Nowhere in the San Gabriel National Monument mountains, CA. It’s where I cut my hiking and backpacking teeth; it’s the first place I’ve witnessed the changing of the seasons and come to know as a second home on the trail. He naps as I maneuver the winding mountain roads and wakes with anticipation when I finally pull into the familiar parking lot. There are few cars and even fewer people on the trail; we have it to ourselves in its rugged beauty. I wrangle precious cargo onto my chest and back. In front my wide-eyed son, on my back 40 liters of painting and baby hiking gear. I have an emergency shelter and extra formula packed away, a personal locator beacon just in case of emergencies, my hands full of trekking poles and bear spray at the ready. It all weighs heavily on my shoulders, but the weight is nothing compared to the one on my psyche. I’m back! 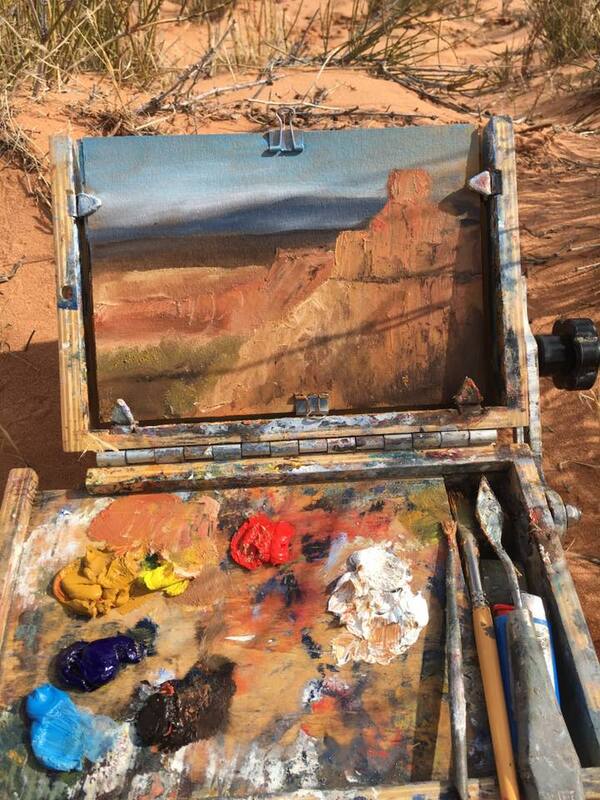 A very complicated and rough pregnancy forced me to take a break from painting on the trails. It was all worth it because now I have a little buddy to take with me. This is Dakota Tayag-Jerz’s official welcome to the world post here on ArtXAdventure! I just got back from wheeling, rafting, camping and hiking in Moab and Arches National Park, UT. Dakota’s three month birthday was on the 19th and he’s already been to Big Sur CA, Sedona AZ, Moab UT, Joshua Tree National Park CA, and the plethora of trails available here in the San Gabriel National Monuments. I have a trans-catalina trail solo coming up soon, so stay tuned for more adventure and art!